On the day of the TACOathon, we make note of the IndieGoGo Campaign totals for each project. From the time we begin, 12pm Wednesday, January 12, 2011, for every $50 raised for each project (can be multiple donors), the corresponding rep will eat a taco. The max number of tacos for each project will be 20. Yes, 20 TACOS!! and few other guests that may pop in! Our goal is to raise $1000 for each project. ALSO, the winning team will get $100 from the losing team. Max prize is $1100! Of course, if we get additional donors we welcome that as well! We hope that by next Wednesday we have raised enough on IndieGoGo that our goals will be reached by the time we end our TACOathon! In order for your donation to count toward the TACOathon, you must donate between 12pm and 8pm on Wednesday, January 12, 2011. Of course, donations are greatly appreciated and encouraged between now and then as well! This event is brought to you by Allison Vanore, Rob Gokee, and Diane Beck. Thank you to Indie Intertube and to our fans for the nominations! Congratulations to all of the shows who were also nominated. 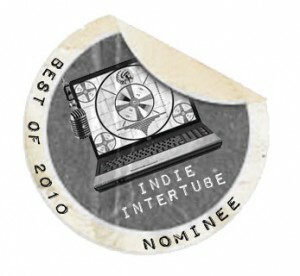 The award show will be streamed online on January 20, 2011 on Indie Intertube. I met Heath over a year ago at a lunch that was inspired by a Twitter conversation. A few of us were discussing how to market and promote our shows online. Bernie Su and Matt Meeks had amazing insight as to how they were promoting their shows and so we all decided to meet for lunch to discuss. At the lunch: Bernie, Matt, Jamie Fishback, Jonathan Nail, Heath Vinyard and myself. How did you become involved with Replaced? The International Academy of Web Television (IAWTV) is currently offering open enrollment for prospective new members. For more information and to apply, click here. Dinner & Drinks at 8pm. Films start rolling at 9pm. Two screens! 21 yrs and up only. If you know of an event, are hosting an event or would like to submit information for next week, please email us here. Thank you for contributing to the event list! If there are mistakes above, please contact us here and provide the revised information. Thank you! Join top HR executives from Hulu, Warner Brothers, ABC, Comcast, LinkedIn and Babelgum for a vital discussion on employment in digital entertainment. Event: Thanksgiving "Let's Give Back 2010"
Event: Singin' In The Rain with Gene Kelly's widow, Patricia Kelly's introduction to the film. Event: RETURN TO OZ plus Q&A with director Walter Murch, moderated by screenwriter Josh Olson. This week I'm launching the IndieGoGo campaign for Replaced Series in order to raise money to shoot pilot episodes of this show. What is Replaced about? Here's a summary: Still grieving from the death of his son and the divorce from his wife that ensued from the tragedy, U.S. Marshal Alexander Finche (Jon Briddell) finds himself the target in a genetic conspiracy and framed for a murder he didn't commit. There is much debate and discussion over the monetization of video content on the web - even just today there were discussions at the NewTeeVee Conference on this topic. Brands, studios and distribution companies are slowly seeing our medium as a viable way to make money. Our community is making entertaining, well written and well acted content and our audience is growing. We're figuring out how to brand, promote and market our shows to our massive global audience. While we continue to pitch and promote our shows we also need to keep doing what we do best. Tell stories. We're committed to telling stories that are unique and inspiring and we aim to build a positive creative force and an engaged fan base behind them. 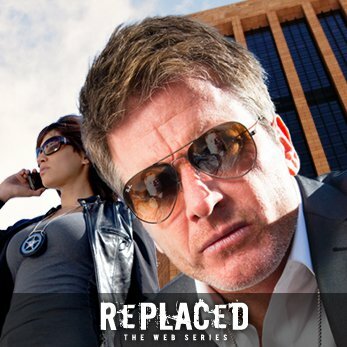 This week we are launching the IndieGoGo campaign for Replaced Series in order to raise money to shoot pilot episodes of this show. We have received funds from a private source and so this fund raising campaign will serve as Gap funding to reach our budgetary goal. We know that with a show like this we can find an audience. Still grieving from the death of his son and the divorce from his wife that ensued from the tragedy, U.S. Marshal Alexander Finche (Jon Briddell) finds himself the target in a genetic conspiracy and framed for a murder he didn't commit. 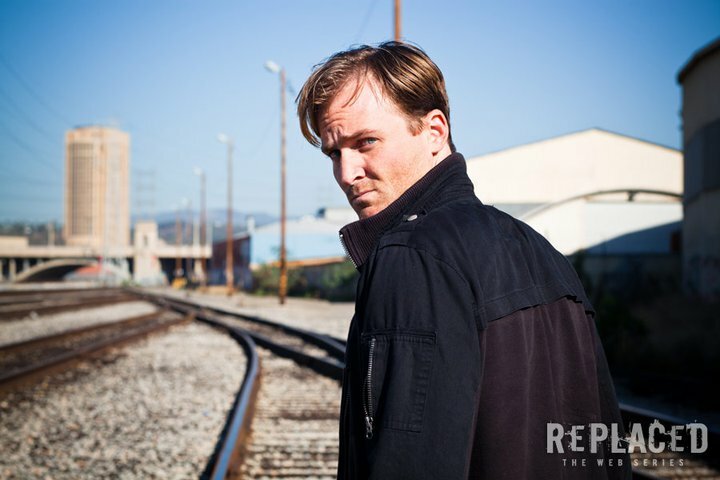 Alex leads a fugitive case and crosses paths with a former geneticist, but now convicted felon Jesse Sinclair (John T. Cogan), who was once an integral part of the plot against Alex, but has now been cast out of the organization, discredited and humiliated in front of his former peers. Alex and his partner Samantha Baine (Lisa Catara) are on the trail of a man named Darren Anderson, a powerful person with whom Sinclair is very familiar and whom he fears. Sinclair knows about Alex’s past, his divorce, the death of his son, and how his life has spiraled out of control since searching for Anderson. On the hunt for Alex is an ex-military Special Forces veteran, Carter Bell, who now heads a government sanctioned private military agency. Bell, instrumental in causing the death of Alex’s son, is relentless and will stop at nothing to capture Alex, even killing those that stand in his way. Those that are not killed are simply REPLACED. Now on the run with his own longtime partner Sam hunting him, Alex must unravel the plot against him, clear his name, and find the elusive architect behind this massive conspiracy that reaches the highest levels he didn't think possible. With $8,500 in additional funds our team will be able to deliver top notch, exciting drama as seen in Vinyard's End Result and a collection of talent brought together by Casting Director, Laurie Records (SOLO The Series). Together with Producer, Allison Vanore (SOLO The Series, Hopelessly in June) this team is unstoppable. This may just be the next successful show on the web. To donate a few bucks (or an entire suitcase full) please visit our IndieGoGo campaign for Replaced Series. Become a Fan on Facebook and follow us on Twitter for the latest news surrounding Replaced! I'd like to announce that I'm now signed on to produce some fantastic new projects! An elderly umbrella salesman tries to survive a summer drought in Brooklyn. A U.S. Marshal is brought in on a homicide case & discovers he is the murdered victim. Through his father’s absence, an imaginative boy attempts to prove to his disbelieving mother that the monster beneath his bed is real. A situation comedy about a family that becomes involved in the culture of medical marijuana. I'll be updating more about these projects and the current projects (SOLO The Series, Hopelessly in June) as news, fund raising and releases/events come up! 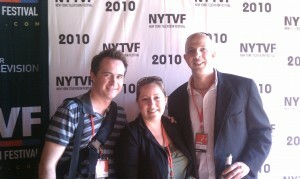 We are still in the middle of NYTVF and we're having a blast. Here representing SOLO The Series is Creator, Jonathan Nail, Producer, Allison Vanore, Music Composer, Rob Gokee and Allison's sister (newly out of film school), Krista Vanore. 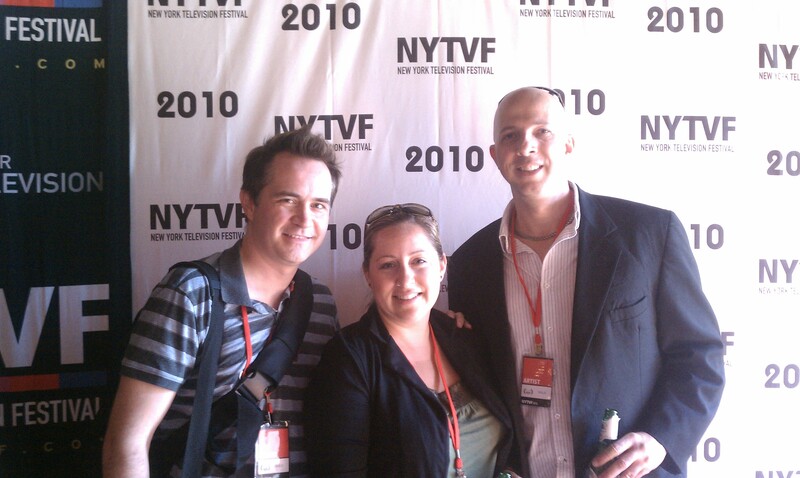 Author adminPublished on September 24, 2010 September 24, 2010 1 Comment on NYTVF A Blast! Tuesday and Wednesday night SOLO screened to a packed audience along side Gentrification, a pilot about two young Caucasian families in LA who recently moved to Highland Park. The comedy is found in the juxtaposition of the white families (with their Prius driving, private school submitting selves) and their Hispanic neighbors. The other pilot we shared a slot with was Greg and Donny. This comedy takes place in Pennsylvania where the characters are more like caricatures of the people the creators grew up around. Lots of laughs all around for the three comedies in our block! Today is Digital Day so we head into NYC to attend a day of panel discussions and screenings later tonight. Tonight Gold: Night of the Zombie King screens so we'll be there supporting our friends, Stephanie Thorpe, Taryn O'Neill, David Nett and Frederick Snyder! 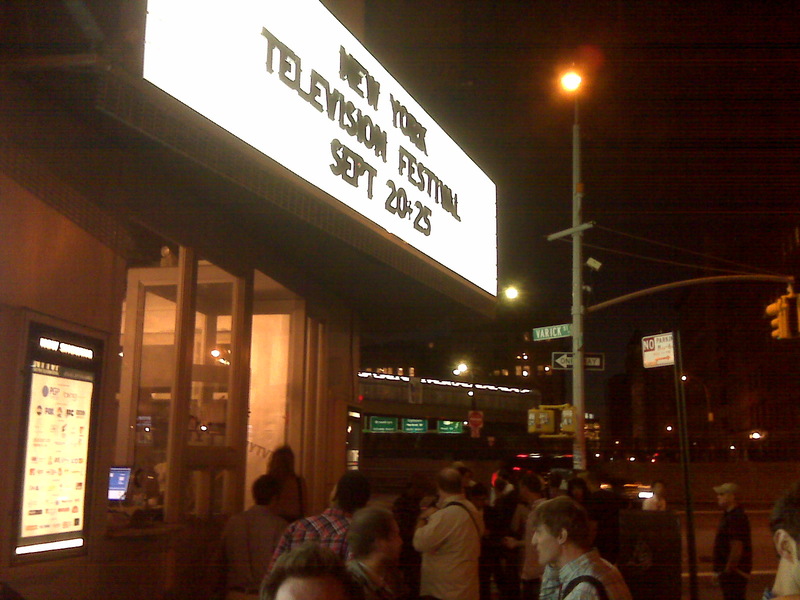 Tomorrow night is the award show where NYTVF will be announcing pilot winners and the famous People's Choice Award! Wish us luck! Published on September 24, 2010 September 24, 2010 Categories Indie filmmaking, Press, Upcoming allieciné Events1 Comment on NYTVF A Blast! Producer Steven Deeble (Thursday’s Lovers) and Producer Allison Vanore (S.O.L.O. – The Series, Hopelessly in June) have joined forces to create a new situational comedy webseries called Compassionate Cleaning Service. Pre-production is well underway so check back regularly for new information, casting notices, and more! Follow Compassionate Cleaning Service on Twitter and become a Fan on Facebook!